Understanding the Development of the Proving Process. Doktorarbeit von Danh Nam Nguyen, Verlag Dr. Kovač 2012, 198 S.
Argumentation and proof have played a fundamental role in mathematics education in recent years. Much of the research that has been conducted on the proving process has been aimed at clarifying the functions and the need of proofs in teaching and learning mathematics, especially its role in the current mathematical curriculum. 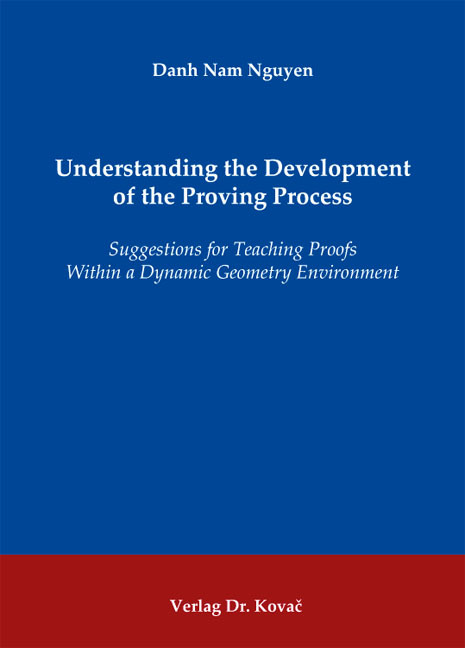 The author of this book investigates the development of the proving process within a dynamic geometry environment in order to support tertiary students understanding the proving process. Through empirically research, different levels of proving in geometry were classified and a methodological model for proving was proposed. This methodological model makes a contribution to improve students’ levels of proving and develop their dynamic visual thinking. This book also offers some possible explanations so as why students have cognitive difficulties in constructing proofs and provides mathematics educators with a deeper understanding on the proving process at the tertiary level.